PDF to HTML | Mac App Storeのアプリ検索・ランキング BuzzMac! PDF to HTML, only need one Drag and Drop. 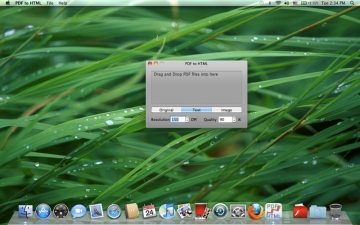 PDF to HTML is a software which can help you converts PDF files into HTML formats on Mac OS X. This tool provide three conversion mode to meet your different pdf conversion needs, Original, Text, Image. Very practical and easy to use. 1. Convert PDF to HTML with Original mode, output html include original layouts, text content, images, and hyperlinks. 2. Convert PDF to HTML with Text mode, output html only include text contents. 3. Convert PDF to HTML with Image mode, convert pdf contents to jpg images (one page one image), output html include these images. 21-in-1 PDF Converter is is now live on Mac App Store, PDF to Word, PDF to PowerPoint, PDF to EPUB, PDF to SWF, PDF to PostScript, PDF to XML, PDF to HTML, PDF to Text, PDF to Image, PDF to JPG, PDF to PNG, PDF to TIFF, PDF to BMP, PDF to EXR, PDF to JP2, PDF to J2K, PDF to TGA, PDF to GIF, PDF to XMP, PDF to DjVu, PDF to SVG, PDF to JSON. Thanks for all reviews, Please contact us at first time when you have any problems.